Most of the book is taken up with a close, meditative reading of each canonical Gospel account. In these chapters, Hays explores the ways in which each Evangelist uses the texts and images of the Old Testament to retell Israel’s story, narrate the identity of Jesus, and ponder the life of the church in relation to the world (p.9). Some intertextual citations in the Gospels are indirect and subtle, so reading with an attuned ear for echoes and allusions is an important aspect of Hays’ reading strategy. He divides the intertextual Old Testament references found throughout the Gospels into three broad categories: “quotation,” “allusion,” and “echo” (p.10). It’s most helpful to think of these categories as being points on a gradual spectrum, “moving from the most to the least explicit forms of reference” (p.10). Mark is generally agreed to be the earliest canonical Gospel. For Hays, “The Gospel of Mark tells a mysterious story enveloped in apocalyptic urgency” (p.15). Mark tends to avoid pointing explicitly to the connections between the Old Testament and the story of Jesus, preferring to be more indirect and allusive (p.98). For those who miss the intertextual allusions, the story is still intelligible and moving. Nevertheless, Hays suggests that cultivating a more sensitive awareness of Mark’s engagement with the Old Testament opens up “new levels of complexity and significance” (p.99). A good example of this is the story of Jesus riding into Jerusalem on a colt in chapter 11. Mark mentions this without comment, but for readers who hear the allusion to Zechariah 9:9 (Lo, your king comes to you; triumphant and victorious is he, humble and riding on a donkey, on a colt, the foal of a donkey, NRSV), the significance of this detail will be more meaningfully understood. Hays uses this episode as an example because it highlights the distinctive narrative styles of Matthew and Mark. In Matthew’s Gospel (unlike Mark’s), he “eagerly supplies the quotation of Zechariah” (p.99). Hays understands this episode to be just one of many indirect, yet meaningful, intertextual references in Mark’s Gospel. Because of the allusive nature of Mark’s narrative, Hays suggests that readers should be attentive lest they “miss the message of Jesus’ divine identity” (p.350). Indeed, one of Matthew’s central claims regarding Jesus is that he is “Emmanuel, the embodiment of the personal presence of Israel’s God” (p.351). Stepping back and looking at Matthew’s Gospel as a whole, Hays notes that one of Matthew’s strengths consists in his hard-to-miss way of engaging with the Old Testament. “He draws clear lines of continuity with the story of Israel and overtly portrays Jesus as ‘God with us'” (p.352). He points out, though, that Matthew’s assertive manner of writing can at times become quite polemical towards other Jewish groups, and that Matthew’s willingness to make overt confessions regarding Jesus’ divine identity “stands in some tension with Mark’s reverent reticence before the divine mystery” (p.352). To me, these differences between Gospel accounts demonstrate why it is helpful for Christian readers to interpret them in light of each other—reading them canonically, as Scripture. This brings us once again to Jesus’ conversation on the Emmaus road. Jesus doesn’t tell the disciples exactly how “all the scriptures” point to him. Instead, we are just assured that they do. Luke implicitly tells his audience that they will have to read retrospectively, going “back to the beginning of the Gospel to reread it, in hopes of discerning more clearly how… Jesus might be prefigured in Israel’s Scripture” (p.223). That, in essence, is the reading strategy that Hays is advocating throughout the book. Luke “boldly narrates the historical continuity between Israel’s past, present, and future” (p.353). Nevertheless, Hays rightly suggests that readers of Luke should avoid understanding him to be advocating an overly-triumphant “salvation-history.” After all, Luke does spend time dwelling upon the necessity of the Messiah’s suffering and weaves the same theme into his subsequent account of the early church (p.354). Regardless, this potential pitfall of overconfidence again points to the value of reading the Gospels canonically, “we need Mark alongside Luke in the canon, as a counterweight to any possible triumphalism” (p.354). Lastly, we come to Hays’ treatment of the John’s Gospel. John’s allusions and scriptural citations often focus less on the repetition of “chains of words and phrases” from the Old Testament and more on “images and figures” (p.284). For example, in John 3, when Jesus tells Nicodemus “And just as Moses lifted up the serpent in the wilderness, so must the Son of Man be lifted up” (3:14, NRSV). Hays writes that despite John’s clear allusion to Numbers 21:8-9, “the only explicit verbal links between the two passages are… ‘Moses’ and the word ‘serpent’… [John’s] intertextual sensibility is more visual than auditory” (p.284). John is frequently described in severely dualistic terms, but Hays argues that the logic of the Fourth Evangelist “drives towards a mystical affirmation of incarnation and of God’s mysterious presence in and through creation,” thereby affirming creation as good, even if fallen (p.355). What are some potential pitfalls of John’s Gospel? There is the danger that some will find John to be anti-Jewish and/or suppersessionistic. Hays disagrees with this reading because such dualistic interpretations mistakenly deny the literal meaning of Israel’s Scriptures. Attributing a figural reading strategy to John, on the other hand, “does not deny the literal sense but completes it by linking it typologically with the narrative of Jesus and disclosing a deeper prefigurative truth within the fleshly, literal historical sense” (p.356). It seems clear to me that this book will come to be known as a masterpiece of close theological reading, an excellent example of why it’s worth spending years thinking deeply about the writings of both the Old and New Testaments. I’m thankful for the work Hays has put into being a scholar who cares both for the Academy and the Church. 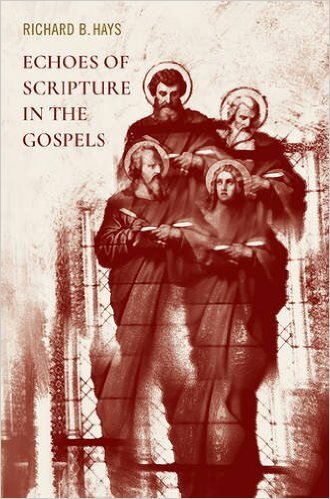 Echoes of Scripture in the Gospels is a real gem, and I can’t recommend it enough. *Disclosure: I received this book free from Baylor University Press for review purposes. The opinions I have expressed are my own, and I was not required to write a positive review. This entry was posted in Book Reviews and tagged Figural Interpretation, gospels, Intertextuality, Jesus, Narrative Dynamics, New Testament, Old Testament, Richard B. Hays by joecrow91. Bookmark the permalink. Cool stuff! Thank you for sharing.